Display query results in multiple formats: JSON, table,and tree. You can also save the query results to a file on disk. 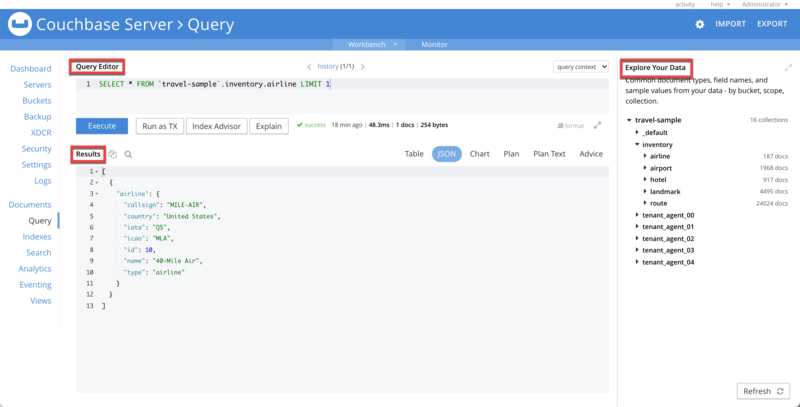 The Query Workbench is now integrated with the Couchbase Web console and is available on the Query tab. The Query Workbench is supported on Windows, Linux, and Mac OS X platforms. 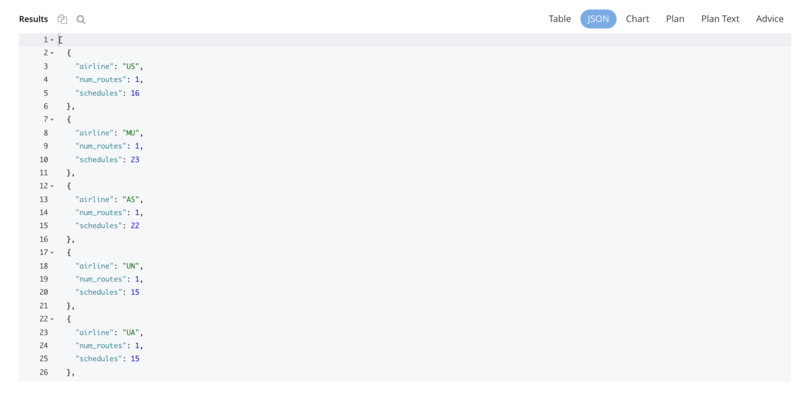 The N1QL editor is where you build queries, and run the queries using the Execute button. Auto-completion - When entering a keyword in the N1QL editor, if you enter the tab key or Ctrl+Space, the tool offers a list of matching N1QL keywords and bucket names that are close to what you have typed so far. For names that have a space or a hyphen (-), the auto-complete option includes back quotes around the name. If you expand a bucket in the Bucket Analyzer, the tool learns and includes the field names from the schema of the expanded bucket. Query history - The tool maintains a history of all the queries executed. Use the arrow keys at the top of the editor to navigate through the history. If you edit a previous query and execute it, the new query is stored at the end of the history. The history is persistent across browser sessions. Use the Clear History button if you wish to start over. The query history only saves queries; due to limited browser storage it does not save query results. Thus, when you restart the browser or reload the page, you can see your old queries, but you must re-execute the queries if you want to see their results. Clearing the browser history clears the history maintained by the N1QL Editor as well. Save query - You can save a query to an external text file using the Save Query button. By default, the query is saved as a text file (.txt) in the Downloads directory. When using Safari, clicking Save loads the data into a new window. You have to save the file manually using the File Save As menu. JSON (default), where the results are formatted to make the data easy to read. You can also expand and collapse objects and array values using the small arrow icons next to the line numbers. Table, where the results are presented in a tabular format. The tool converts the JSON documents to HTML tables, and presents sub-objects or sub-arrays as sub-tables. This format works well for queries that return an array of objects, like select `beer-sample`. * from `beer-sample`;. You can hover the mouse pointer over a data value to see the path to that value in a tool tip. You can cancel running queries using the Cancel button on the Query Workbench. When you cancel a running query, it stops the activity on the server side as well. If you change to a different tab in the Couchbase Web Console when a query is running in the Query Workbench, the query will be interrupted on the client side. However, the query continues to run on the server. If you do need to change to a different tab when running a query, we recommend that you first terminate the running query using the Cancel button before changing the tab in order to avoid wasting server resources.